Did he get carried away by all the attention in Washington? Just 24 hours after being labelled as a good friend by US President Donald Trump, Taoiseach Enda Kenny has his eyes on sticking around for a while longer. Mr Kenny is now suggesting he will stall the forthcoming Fine Gael leadership race until he can deal with the "immediate priorities" of Northern Ireland and Brexit. 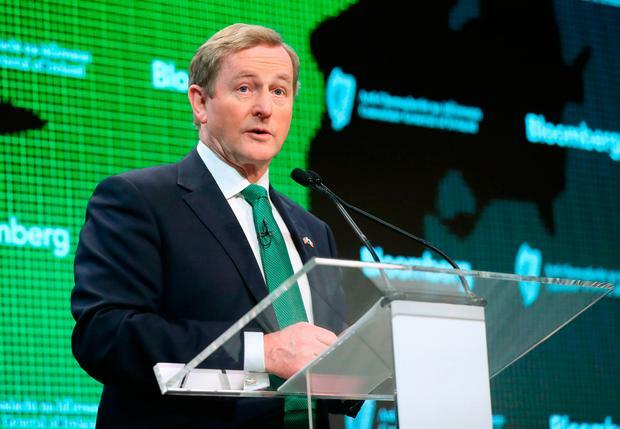 The Taoiseach was in New York yesterday, striding down the one-and-a-half miles of a green traffic line along Fifth Avenue that guided the St Patrick's Day marchers down the parade route. He indicated he won't be making a prompt statement on his resignation when he returns from America. And he rejected several questions on his future plans, saying he'll deal with the Fine Gael parliamentary party. "I have a number of immediate priorities on my desk when I arrive back tomorrow morning at 10 o'clock and I intend to get started on those," he said. Forgive us for showing an interest in the future leadership of the country. This is about far more than just the Fine Gael leadership. Mr Kenny appears to have failed to draw the distinction between the current circumstances and when he became party leader 15 years ago, when Fine Gael was a struggling opposition party. He deserves credit for transforming his party but he must accept his successor will become our next Taoiseach. Within the party, it is unlikely Mr Kenny will get a warm reception to the notion he's going to stick around longer. The saga of the Taoiseach's clinging to power is a distraction from the important business of Government. After the farewell tour comes the farewell. She was the daughter of a revolutionary veteran who went on to become Taoiseach. And she married a future Taoiseach. Maureen Haughey, nee Lemass, truly did live through interesting times. Her family respectfully announced the death of the daughter of the late Seán Lemass and wife of the late Charles J Haughey. She was 91 and passed away at the Mater Hospital following a short illness. Sadly telling of his mother’s peaceful passing, Fianna Fáil TD Sean Haughey described her as “a truly remarkable woman”. His party leader Micheál Martin noted she was a “wonderfully warm, dignified and intelligent woman”. “Maureen was a very active woman and kept a keen interest in the evolution of Irish society. She was a patriot who loved her country and retained a key interest in the development of Irish society,” he said. Although Seán Lemass was more closely associated with the War of Independence, he also fought in the Easter Rising. Appropriately, Maureen Haughey was present for a number of the Ireland 2016 100th anniversary commemorations. She will, however, be remembered sympathetically by many for the manner in which she dealt with the revelations around her husband’s personal life. It can’t have been an easy time in her life, yet she always displayed a quiet dignity in the face of those difficulties.